Is it an experiment doomed to failure? We have been trawling through the fruit markets of Cabramatta, Sydney’s home for many people of Vietnamese heritage - and others of Southeast Asian extraction - for some years. The many fruit stalls hold a million surprises… surprises unlikely to be found in most other shopping concourses. It is well-known throughout Sydney that, if you would like to try some tropical fruit treats, a stroll through the streets of Cabramatta, should satisfy your desire. Even today, there are still new experiences… As Sydney’s burgeoning Asian population continues to climb, the demand for products from the ‘old’ countries increases in equal step. 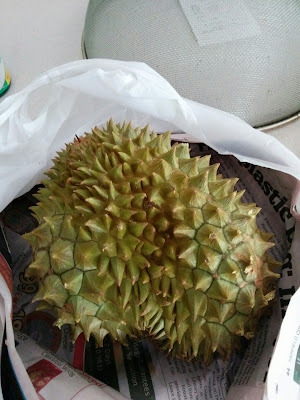 Over the years, we have seen the stalls of frozen durian, usually the product of Thailand, but some more expensive fruit imported from Malaysia, also frozen. For the Better-Half, a connoisseur of the King of Fruits, the prospect of frozen durian is a damp prospect: it is durian, but it cannot compare with the fresh item, consumed in abundance by her on our annual jaunts to Malaysia. And this was our latest Cabramatta surprise, a Christmas surprise : Malaysia’s most famous durian, the legendary Musang King lazing proudly on a portion of a local stall! Not frozen, but fresh. Absolutely fresh! Expensive by Australian fruit standards at around $30 per kilo, but here it was… The King of Kings! It sat in equal company with another Malaysian durian, D24. But, alas, D24 was frozen. 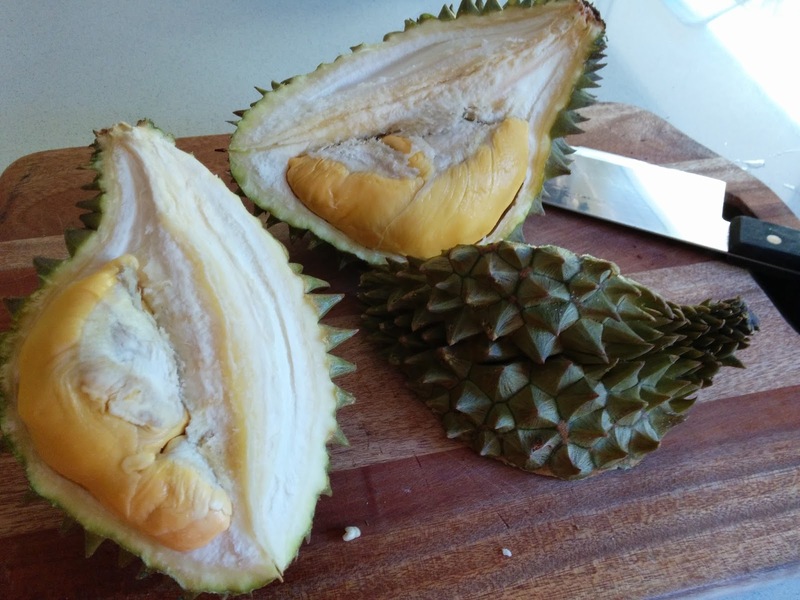 As we were to learn from the stallholder, Musang King durian is now grown in Northern Australia. If you are a lover of durian, you can imagine the delight etched on the Better-Half’s face when we removed the prize from its newspaper and plastic wrapping. The aroma - or smell, depending on your perspective – is pervasive. This is followed by the ceremonial opening with a heavy cleaver: for her, the opening of a Musang King durian is like locating and unlocking buried treasure. Golden buried treasure. Well, we gave it a go. The healthy-looking seeds of the Musang King were planted in five pots and placed for protection under the shade of our banana tree. Surely, at almost 34 degrees south of the Equator, there would be little chance of our durian seeds sprouting. And sprout they did. With constant summer heat and warm, warm nights, our durian seeds began to unfurl, first a tap root, and then a small shoot. Four signs of life from five seeds. This easy success, of course, leaves us with a problem: how to care for a plant, truly endemic to tropical rainforests. Our best guess, and our only solution, will be to keep our tender seedlings in the warmest winter window of the home. And the first shoot appears... sideways! Even this will probably not be good enough: we don’t harbour high hopes of keeping our durian seedlings alive through cold winter nights. As the warm weather departed, our five durian seedlings were placed under cover in a portable greenhouse, along with our other prize seedlings. Two of our five seedlings persisted, right through the cool of winter, raising our hopes that one might succeed and flourish as the weather warmed again throughout the summer. Unfortunately, our last seedling passed on during January: its root structure had been damaged by the winter cold, and, despite attentive care, it failed to hold its new growth... Experiment failed! Wow!!! which shop in Cabramatta sold this??? Sorry Andy. I cannot tell you the name of the shop but it faces Dutton Lane. The Musang King Durians should be there again in December.